ok, so in trying to diagnose my cars prob, a guy said I might need to shim my starter. As far as I knew, I did not need any shims b/c there were none to begin with. I dont know if aftermarket starters need to be shimmed or what. So, who here has had to shim their starter? How do you do it? Am I completely wrong and I def. dont need a shim? 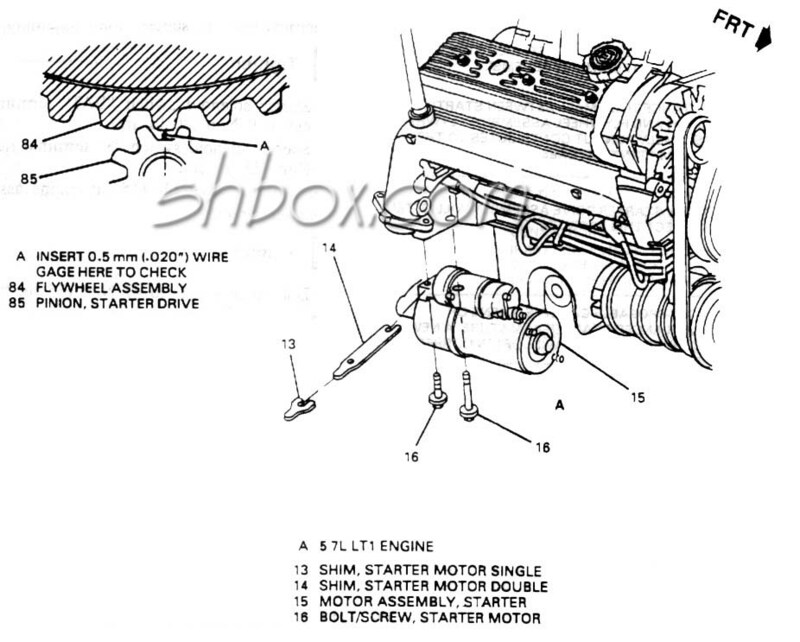 The only reason you'd need to shim your starter would be if the gear didn't line up with the flywheel correctly. Shims are universal, all they are are little peices of metal that align with the bolt holes of your starter to lower it's position to align the teeth with the flywheel. Some aftermarket starters come with them, some don't. At work, only about half of our Duralast starters come with a set of shims, then we sell them in ilke a 4 pack for a couple bucks. Why did your friend say you'd need to shim it, is it having a hard time turning over? I have an intermittant problem of the car not starting. I have power everywhere, and when I turn the key to START, I get one single click and nothin'....so that lead me to try "this and that" to get it to start. Well, I move the car a few inches and pop the clutch; this moves something(flywheel?) and the car then starts. I think the prob is mechanical, being that I can remedy it by doing the method stated above. I was going to start investigating the VATS system until a guy mentioned the shim thing. I didn't see any shims when I took out the old starter , so I figured they werent necessary. So I described the prob to the guy and he said it probably needs shims. Any time you change the starter, you may need shims. It depends on how that particular starter mates to the block. It's possible, but seems unlikely... generally starters have enough torque to turn the engine over even if they aren't perfectly lined up. The click you're hearing might be the starter drive gear engaging, and it's just not spinning. Have your starter tested somewhere. If that checks out fine, then I'd look into your ignition switch, probably not VATS related directly though. Off topic: Shoebox, is that a diagram from All Data? I just got it installed a few weeks ago on my laptop. And I had no idea you're from Little Rock, I live in benton, like 30 minutes from you. We should meet up some time. I'll be going to UCA next year. No, it is from a factory manual. My daughter graduated from UCA a few years back. yes, I have asked around and it is probably has nothing to do with shims. - I am now going to check out the lock cylinder and ignition switch. Did you ever figure out the problem ? I have a 94 lt1 firebird I just changed the starter on and it still makes that single click. Fired right up when i put the new starter in and now it just makes the same click noise. Some guy told me I need to put shims in my starter.